Blue Phoenix Financials Is An Online Wealth Advisory Concept that aims to be a game changer In the Wealth Management Sector with the provision of FREE financial advice covering Global Major Asset Classes including Bonds, Options, ETFs and Futures. Blue Phoenix Financials provides users relevant and invaluable information including Market Tips, Analyses & Strategies while helping subscribers navigate the complexities of global investment through the aid of Strategies, Videos and Global Market Blogs. For serious investors, on the other hand, there’s the Blue Phoenix Financials Premium Content. This boundary-breaking offering provides an in-depth view of global financial markets through Insider Market Inflows, Micro & Macro Analysis, Market Trends and Entry/Exit Points while also providing a detailed list of catalysts to enable investors to capitalise on, and profit from, Major Market Movements. 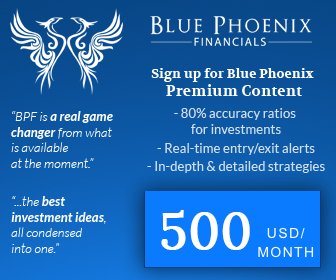 Blue Phoenix Financials Premium Content will be available from Jan 2013 onwards at an introductory fee of US$500 per year OR US$50 per month. Blue Phoenix Financials aims to contribute towards restoring investor confidence in the wealth management industry by operating with transparency, accuracy and neutrality, crucial elements that have been neglected since the 2008 global financial crisis. We are committed to educating investors with integrity, equipping new and experienced investors alike with the best possible research so that they can trade with better peace of mind through their chosen channels, whether banks, securities firms, futures brokers or online platforms. Additionally, the Blue Phoenix Financials Premium Content strives to provide subscribers an edge in reaping rewards from the global markets through timely information and extensive research including Insider Market Flows, Analysis, Strategies & Catalysts. This breakthrough concept will aid in nurturing professional investors with holistic and relevant knowledge of the global market and who, through effective investment, will provide critical liquidity while enhancing price discovery. When you have interest in a particular article or strategy that is published on our website and would like to be kept informed about further developments, all you have to do is click on the track button and the next time we update information on the website that contains the subjects, companies and strategies that you are interested in, an email alert will be sent to you alerting you of a latest update.